Upadana (Clinging), where the traditional four types of clinging are clinging to sense-pleasure (kamupadana), wrong views (ditthupadana), rites and rituals (silabbatupadana) and self-doctrine (attavadupadana). ↑ These fetters are enumerated, for instance, in SN 45.179 and 45.180 (Bodhi, 2000, pp. 1565-66). This article's Pali words and English translations for the ten fetters are based on Rhys Davids & Stede (1921-25), p. 656, "Saŋyojana" entry (retrieved 2008-04-09). ↑ Rhys Davids & Stede (1921-25), pp. 660-1, "Sakkāya" entry (retrieved 2008-04-09), defines sakkāya-diṭṭhi as "theory of soul, heresy of individuality, speculation as to the eternity or otherwise of one's own individuality." Bodhi (2000), p. 1565, SN 45.179, translates it as "identity view"; Gethin (1998), p. 73, uses "the view of individuality"; Harvey (2007), p. 71, uses "views on the existing group"; Thanissaro (2000) uses "self-identify views"; and, Walshe (1995), p. 26, uses "personality-belief." ↑ Rhys Davids & Stede (1921-25), p. 615, "Vicikicchā" entry (retrieved 2008-04-09), defines vicikicchā as "doubt, perplexity, uncertainty." Bodhi (2000), p. 1565, SN 45.179, Gethin (1998), p. 73, and Walshe (1995), p. 26, translate it as "doubt." Thanissaro (2000) uses "uncertainty." Harvey provides, "vacillation in commitment to the three refuges and the worth of morality" (cf. M i.380 and S ii.69-70). ↑ See, for instance, Rhys Davids & Stede (1921-25), p. 713, "Sīla" entry (retrieved 2008-04-09), regarding the similar concept of sīlabbatupādāna (= sīlabbata-upādāna), "grasping after works and rites." Bodhi (2000), p. 1565, SN 45.179, translates this term as "the distorted grasp of rules and vows"; Gethin (1998), p. 73, uses "clinging to precepts and vows"; Harvey (2007), p. 71, uses "grasping at precepts and vows"; Thanissaro (2000) uses "grasping at precepts & practices"; and, Walshe (1995), p. 26, uses "attachment to rites and rituals." ↑ For a broad discussion of this term, see, e.g., Rhys Davids & Stede (1921-25), pp. 203-4, "Kāma" entry, and p. 274, "Chanda" entry (retrieved 2008-04-09). Bodhi (2000), p. 1565 (SN 45.179), Gethin (1998), p. 73, Harvey (2007), p. 71, Thanissaro (2000) and Walshe (1995), p. 26, translate kāmacchando as "sensual desire." ↑ Rhys Davids & Stede (1921-25), p. 654, "Vyāpāda" entry (retrieved 2008-04-09), defines vyāpādo as "making bad, doing harm: desire to injure, malevolence, ill-will." Bodhi (2000), p. 1565, SN 45.179, Harvey (2007), p. 71, Thanissaro (2000) and Walshe (1995), p. 26, translate it as "ill will." Gethin (1998), p. 73, uses "aversion." ↑ Rhys Davids & Stede (1921-25), pp. 574-5, "Rūpa" entry (retrieved 2008-04-09), defines rūparāgo as "lust after rebirth in rūpa." Bodhi (2000), p. 1565, SN 45.180, translates it as "lust for form." Gethin (1998), p. 73, uses "desire for form." Thanissaro (2000) uses "passion for form." Walshe (1995), p. 27, uses "craving for existence in the Form World." ↑ Rhys Davids & Stede (1921-25), pp. 574-5, "Rūpa" entry (retrieved 2008-04-09), suggests that arūparāgo may be defined as "lust after rebirth in arūpa." Bodhi (2000), p. 1565, SN 45.180, translates it as "lust for the formless." Gethin (1998), p. 73, uses "desire for the formless." Harvey (2007), p. 72, uses "attachment to the pure form or formless worlds." Thanissaro (2000) uses "passion for what is formless." Walshe (1995), p. 27, uses "craving for existence in the Formless World." ↑ Rhys Davids & Stede (1921-25), p. 528, "Māna" entry (retrieved 2008-04-09), defines māna as "pride, conceit, arrogance." Bodhi (2000), p. 1565, SN 45.180, Thanissaro (2000) and Walshe (1995), p. 27, translate it as "conceit." Gethin (1998), p. 73, uses "pride." Harvey (2007), p. 72, uses "the 'I am' conceit." ↑ Rhys Davids & Stede (1921-25), p. 136, "Uddhacca" entry (retrieved 2008-04-09), defines uddhacca as "over-balancing, agitation, excitement, distraction, flurry." Bodhi (2000), p. 1565 (SN 45.180), Harvey (2007), p. 72, Thanissaro (2000) and Walshe (1995), p. 27, translate it as "restlessness." Gethin (1998), p. 73, uses "agitation." ↑ Rhys Davids & Stede (1921-25), p. 85, "Avijjā" entry (retrieved 2008-04-09), define avijjā as "ignorance; the main root of evil and of continual rebirth." Bodhi (2000), p. 1565 (SN 45.180), Gethin (1998), p. 73, Thanissaro (2000) and Walshe (1995), p. 27, translate it as "ignorance." Harvey (2007), p. 72, uses "spiritual ignorance." ↑ For single-sutta references to both "higher fetters" and "lower fetters," see, DN 33 (section of fives) and AN 10.13. In other instances, a sutta regarding the lower fetters is followed by a sutta regarding the higher fetters, as in: SN 45.179 and 45.180; SN 46.129 and 46.130; SN 46.183 and 46.184; SN 47.103 and 47.104; SN 48.123 and 48.124; SN 49.53 and 49.54; SN 50.53 and 50.54; SN 51.85 and 51.86; SN 53.53 and 53.54; and, AN 9.67 and 9.70. In addition, the five lower fetters alone (without reference to the higher fetters) are discussed, e.g., in MN 64. ↑ See, e.g., MN 6 and MN 22. ↑ Rhys Davids & Stede (1921-25), p. 656, "Saŋyojana" entry references Cula Niddesa 657, 1463, and Dhamma Sangani 1113. In fact, an entire chapter of the Dhamma Sangani is devoted to the fetters (book III, ch. V, Dhs. 1113-34), see also Rhys Davids (1900), pp. 297-303. (Rhys Davids, 1900, p. 297, provides the following English translations for these Pali terms: "sensuality, repulsion, conceit, speculative opinion, perplexity, the contagion of mere rule and ritual, the passion for renewed existence, envy, meanness, ignorance.") In post-canonical texts, this list can also be found in Buddhaghosa's commentary (in the Papañcasudani) to the Satipatthana Sutta's section regarding the six sense bases and the fetters (Soma, 1998). ↑ Ñāṇamoli & Bodhi (2001), pp. 467-469, and Upalavanna (undated). For a Romanized Pali transliteration, SLTP (undated). ↑ Rhys Davids & Stede (1921-25), pp. 660-1, "Sakkāya" entry (retrieved 2008-04-09). See also, anatta. ↑ Rhys Davids & Stede (1921-25), p. 597, "Vata (2)" entry (retrieved 2008-04-09). ↑ Ibid., p. 421, "Parāmāsa" entry (retrieved 2008-04-09). ↑ Ibid., p. 713, "Sīla" entry regarding the suffix "bbata" (retrieved 2008-04-09). ↑ For instance, see Gethin (1998), pp. 10-13, for a discussion of the Buddha in the context of the sramanic and brahmanic traditions. ↑ Soma, 1998, section on "The Six Internal and the Six External Sense-bases." It is worth underlining that only the fetter is abandoned, not the sense organs or sense objects. ↑ Ñāṇamoli & Bodhi (2001), pp. 537-41. ↑ Bodhi (2000), p. 1148. ↑ Bodhi (2000), p. 1148. 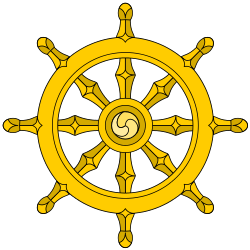 Note that the referenced suttas (MN 64, SN 35.54 and SN 35.55) can be seen as overlapping and consistent if one, for instance, infers that one needs to use jhanic attainment and vipassana insight in order to "know and see" the impermanence and selfless nature of the sense bases, consciousness, contact and sensations. For a correspondence between impermanence and nonself, see Three marks of existence. ↑ See, e.g., Bhikkhu Bodhi's introduction in Ñāṇamoli & Bodhi (2001), pp. 41-43. Bodhi in turn cites, for example, MN 6 and MN 22.